Overseas aid is planned to be a life­giving stream of help to the areas where poverty is greatest. But scarcely a trickle gets through. 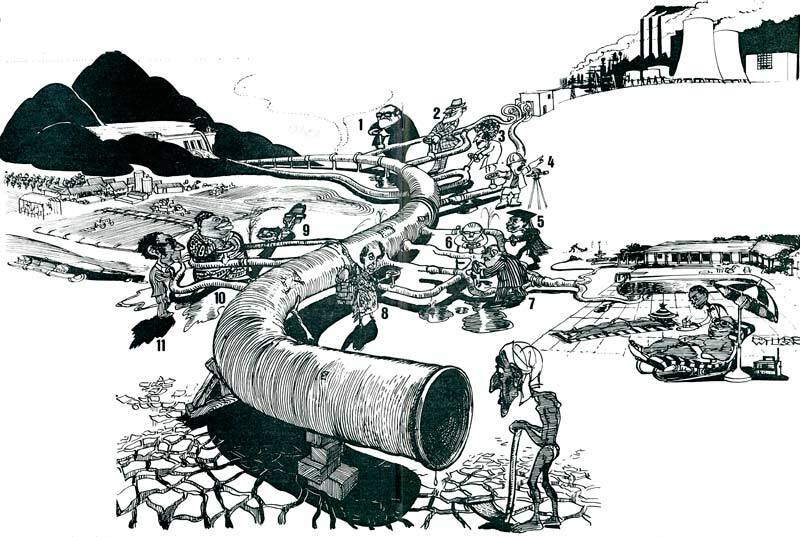 The *New Internationalist* sketches some of the drains en route, and just where the flows end up. Owners of capital will only invest in the 'unstable' devel­oping world if tempted by high profits. This investment is called 'aid', but whether it is in mining, plantations or industry the quick returns mean few local benefits. Pressure groups in the aidgiving countries lobby for aid money to flow in their direction. For example Australian aid buys wheat which helps their own farming lobby. Whether it helps the underdeveloped world is questionable. Much of the aid stream is short-term. It is a loan which has to be pumped back to the donors - with interest. While aid loans are on softer terms than the commercial rates, the long term effective help is far less than aid in grant form. More than a quarter of all aid money is used to pay the wages of foreign experts. These people are given repatriation bonuses and often accumulate nesteggs from their high salaries. Such money leaves the country on completion of their contract. i) scholarships to train students at universities like Harvard, Oxford, the Sorbonne or Moscow. ii) building and staffing Third World universities, where the outlook and curriculum is unsympathetic to local needs. Many development aid programmes require more Third World civil servants for administration. Highly paid bureaucrats proliferate in the poor countries. Aid programmes allow fat contracts to be awarded to relatives and friends of the powerful. Aid flows can be used to float prestige projects like nuclear power stations, reactors, airlines and conference centres. This helps donors as the returns are tangible, easily photographed for publicity back home and 'apolitical'. It helps local politicians whose reputations are enhanced by such symbols of progress. Donor demands for strict accounting of the finances of the aid projects means that money will flow mostly to the large, sophisticated schemes where there is expertise to provide such feedback. Much of the development money pumped into rural regions stimulates cash crop production and encourages mechanization - and fertilizer use. So the bigger farmers use less labour and buy up more land. Aid can provide a pool of credit for local bank loans to farmers for modernization. The banks lend to good credit risks - those with sufficient assets. They provide rich farmers with more funds to expand at the expense of the poor.